This is a groundbreaking study of our culture's obsession with weddings. 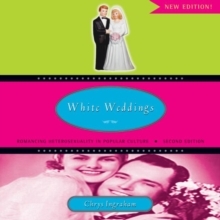 By examining popular films, commercials, magazines, advertising, television sitcoms and even children's toys, this book shows the pervasive influence of weddings in our culture and the important role they play in maintaining the romance of heterosexuality, the myth of white supremacy and the insatiable appetite of consumer capitalism. It examines how the economics and marketing of weddings have replaced the religious and moral view of marriage. This second edition includes many new and updated features including: full coverage of the wedding industrial complex; gay marriage and its relationship to white weddings and heterosexuality and demographics shifts as to who is marrying whom and why, nationally and internationally.